On Friday, 25 November, curator Jean-Hubert Martin gave a talk about transhistorical curating. 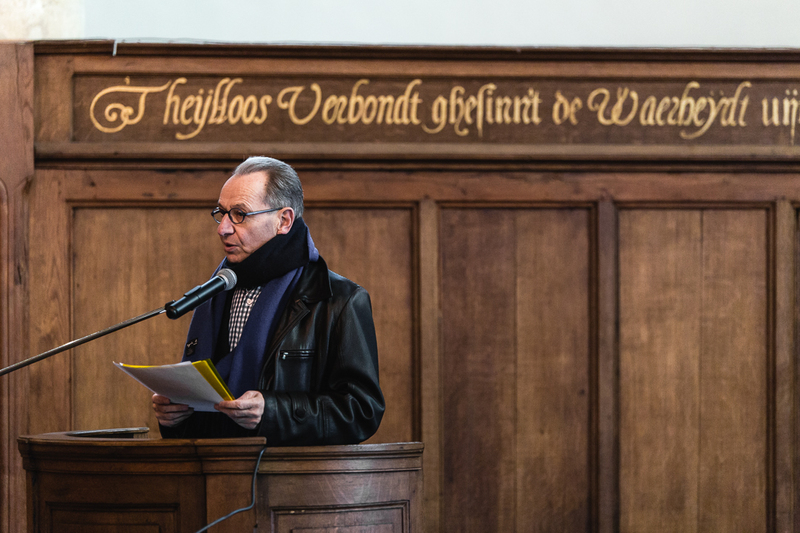 This breakfast lecture was organized by the Frans Hals Museum I De Hallen, Castrum Peregrini, Museum Van Loon and the Oude Kerk – four institutions that share a special interest in the subject. Martin established his reputation as a curator with important exhibitions such as Magiciens de la Terre (1989) and his recent Carambolages (2016), in which he juxtaposed objects from different art-historical periods and cultures. The curator is renowned for the historical importance of his work, but his work also evokes pertinent questions. For example, might this mode of presentation apply as art historical critique? And how do the transhistorical presentations relate to contemporary politics? During the lecture, Jean-Hubert Martin revealed many of his considerations that were crucial for the Carambolages exhibition. Martin’s key criterion in the selection of works of art and objects for an exhibition is whether they work. Does something deviant arise, something strange in the combination of these images? Is the imagination fired, one’s memory activated? Carambolages was grouped around a number of themes, with works of art being brought together on the basis of a purely associative relationship, usually based on a particular form or motif. The title Carambolages refers to the game of billiards and the ‘cannon’ shot, which involves a player hitting a single ball so that it rebounds against two other balls. The title hints that works of art have more than a single meaning or context, as the (art) historical chronology prescribes; no, they are part of a much more complex whole. Each object can serve as the reason for a miscellany of associative threads. The primary idea of this presentation was to encourage visitors to look at the objects themselves. The presentation of objects without titles or textual explanation was intended to encourage personal reflection and perception. The explanation wasn’t provided until the visitors had seen the art. Martin’s exhibition and his text in the catalogue are an indictment of museums and curators who are obsessed with the categorization and explication of works of art, thus holding the gaze of the beholder in a power-hold. Martin is thereby arguing for the introduction of the gaze of the artist as the point of departure for the curators of exhibitions. This is open, associative and critically inquisitive. This gives the visitor the opportunity to form a personal opinion. But is that what the visitor does? was one of the questions from the audience. Certainly, as the visitor often views the objects again after reading the textual explanation. Initially on their own and the second time with a guided gaze. Martin added that he never reads exhibition texts: the work must speak for itself, and if it doesn’t then it’s not a good work of art. The session concluded with a number of questions from the public. Can transhistorical curating also be politically inspired? Martin is resolute about this: Our political reality plays no part whatsoever in his approach to curating, as he doesn’t consider it relevant. Alas, for many curators this meant that an intriguing perspective on transhistorical curating wasn’t touched upon. Which isn’t to say that it wasn’t an interesting, cold and very early morning. With coffee and croissants in hand, a group of international curators (brought together by the Amsterdam Art Weekend) continued to exchange ideas at length with colleagues from the Netherlands.